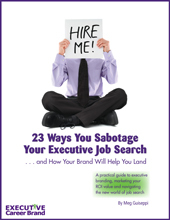 Do you have your nose deep into the job boards, investing hours daily searching and posting your resume? Then you’re focusing on a strategy that usually yields dismal results. 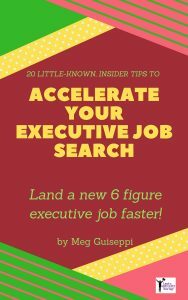 Executives should be leveraging LinkedIn to search jobs, research companies for market intelligence and due diligence, and connect/re-connect with people. LinkedIn’s search capabilities will yield a much better return for your efforts. Step one is to set up your home base. If you already have a profile, it may need revamping. Make your profile resonate with your target audience, and be brand-evident and searchable for recruiters and hiring decision makers sourcing candidates like you. 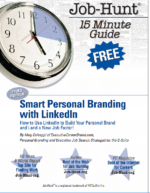 Download my free e-book to learn how to bring it all together, Executive Branding and Your LinkedIn Profile: How to Transform Your Executive Brand, Resume, and Career Biography Into a Winning LinkedIn Profile. Remember to revisit your profile and re-focus your professional headline and other relevant information whenever your target changes. You’ll find the tab in the top menu on the home page, along with People, Answers, and Companies. A quick search I just did for “VP of Sales” yielded some 75 results across all industries, located within 50 miles of my own rather remote location. 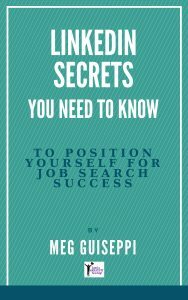 “Advanced Job Search” will help you narrow results for many criteria. 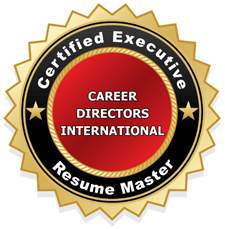 Results include the company (with link to their LinkedIn profile), location, date posted, and who posted the listing (with link to their LinkedIn profile). In the right sidebar of the Jobs home page, you’ll notice a list of “Companies in my network” whose profiles you can explore. Results include exclusive job listings found only on LinkedIn. LinkedIn also provides their own list of Job Search Tips. One of LinkedIn’s most powerful features, the companies tab provides a wealth of valuable information to gather research on companies of interest and find hiring decision makers and people in their circles. Take a look at Liz Lynch’s excellent post at the Personal Branding Blog, The Hidden Goldmine Within the LinkedIn Companies Tab.